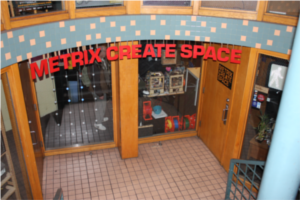 When you walk into Metrix Create: Space in the Capitol Hill neighborhood of Seattle, it's hard to know exactly what you've gotten yourself into. With long tables piled with electronics, 3D printers tucked in corners, a vending machine that offers Arduino shields alongside M&Ms, and a large, looming Pick and Place peeking out from inside a glass room, you've either stepped into the future or onto the deck of the Enterprise. 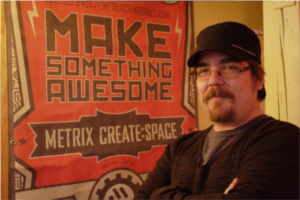 Matt Westervelt, owner and founder of Metrix, considers it one part tech shop, one part hackerspace, one part coffee shop but 100% open to the public. As a public workshop with over 10 different "robots" at your disposal, the only limitation here is "What can you make?" Projects here range from writing software to laser cutting; from casting 3D ducks to soldering; from designing Arduino boards to 3D printing. Inkfarm.com visited the shop last week for 3D Thursday to talk with Westervelt about Metrix's roots, where it's going and the ever-evolving technology it houses. Tell me about Metrix; how did it start? Metrix came about because I started a project called Seattle Wireless in 2000, and it had this weekly thing we called "HackNight". We had a space back in the early 2000s in Georgetown, which had computers and couches and fast internet. It was kind of like this but not open to the public. It was more oriented towards hacking on WiFi, mesh networking and computer stuff. Eventually we dropped that space and started hanging out every week at cafes. In 2004, I started metrix.net, which is the WiFi business, and we started meeting in my office which over on Pine St. In 2009, I got a laser and thought "What am I going to do with this laser?" One thing was to build a 3D printer, the other one was to start asking people "What would you do if you had a laser?" It turns out that people all had different answers and really just wanted occasional access to laser - then I found this place. I've heard the term "hacker" and "hackerspace" used a lot lately - what do they refer to? Hacking means a lot of different things; it's a pretty loaded term. Mostly, it's I'm trying-to-get-something-to-work and I'll hack at it. We're all "pretendgineers" here; the people who work here aren't real engineers. Some of us kind of are, but for the most part, we're doing things we're interested in and hacking on things. People come down and they want to make stuff - it's like "Oh, I haven't done that before but I bet you we could figure out how to do it with the stuff we have lying around." Hackerspaces are generally collective projects like this, where it's a space where people come to make things, to collaborate. This one is different in that it's a commercial space; it's open to the public. It's not a communal kind of thing. I think it has to be this way, simply because of where we're located - I mean, we're right on Broadway. Bills are high, and we have a lot of resources. To keep those resources, bills have to be paid. That's a lot harder to do in the other methods of doing it. 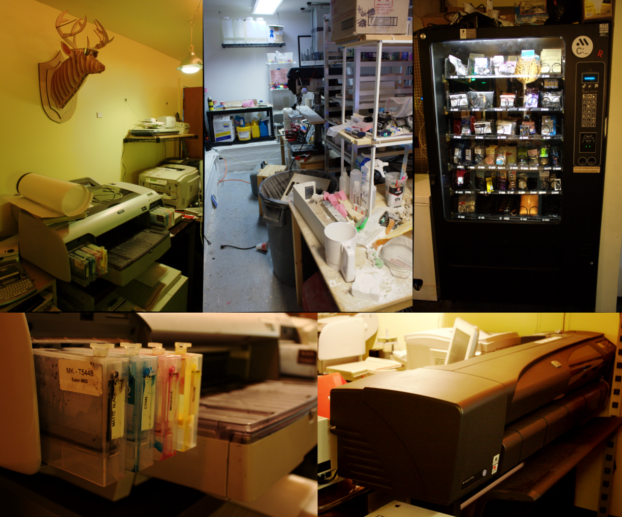 Usually, when you look at hackerspaces, all the advice they give you is "Go find a place with really cheap rent." We went the opposite way. From L to R: Office Space at Metrix, the Soldering Room, and available extra materials. What is the opensource and reppap movement? Opensource is the way to do things. I've been a part of opensource for a long time; and we've maintained and contributed to a lot of opensource projects - we try to be as transparent as possible. It's easier to learn things when people share information. It seems to me that that's the way to do it. And most people who are into this type of behavior use opensource because it's the only way it can move at the speed that it does. How was it before you had a fixed space? Before, hacknight was more of a group thing. We were hanging out, working on software projects, some hardware problems - it was mostly focused on how to build a Wi-Fi community. Although there's a certain amount of hardware involved with that, it's not the same. And we would just monopolize tables at coffee shops. We would generally show up at a place and take over. A lot of the coffee shops we used to go to - the Drink More, Online Coffee - they're all gone. We would always find these places that were empty, and yet kind of interesting - and that we could just go in and take over. Unfortunately, a bunch of geeks sitting around using computers isn't super conducive to the coffee business. 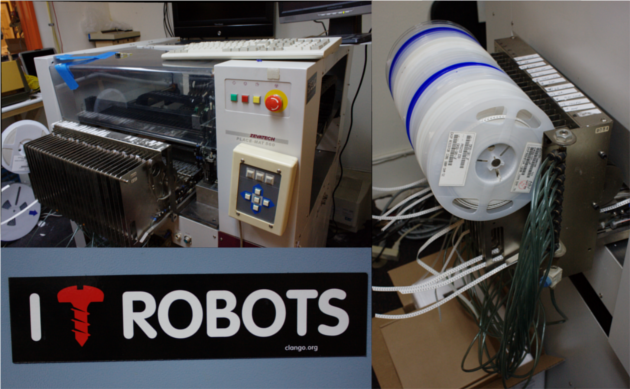 Clockwise from top left: Hi-res printer for photos and posters; the backroom workspace that holds the kiln, laser cutter and 3D powder printer; Metrix's unique vending machine with Arduino shields, LED strips and candy; ink cartridges for the hi-res printer; the large-format printer available for use. What was the initial response to Metrix? People were excited. The Capitol Hill Seattle Blog got wind of it, and people were jazzed when we opened. At 12:01pm - we're open noon to midnight everyday - on the first day, I signed up our first member and I had never met her. I just showed up at 12:01, opened up the door and this woman standing there was like "Sign me up." I said "I haven't even told you how much stuff costs or should you what we have" and she was like "This is the coolest thing." Do you get a lot of walk-ins? Yeah, we get a lot of people walking in from the street. They're like "Hey, what's going on here?" It says soldering on the sign, that doesn't make any sense. Laser cutting, 3D printing - strange things, right? They're going to restaurants, theaters, coffee shops and they see this. So they come down: "What is this?" Oh, it's a 3D printer. "What is this?" It's a laser cutter. "What's that?" That's a Pick and Place. We have this really strange shop full of robots. The hobotoken is just a piece of laser-cut coin. The idea behind it was that people felt weird about hanging out. In the beginning we had coffee, which we were only charging $1 for, but now coffee's free because the robot is broken and we haven't gotten around to fixing it. So now we just have French presses: if you want coffee, you make it and people do. People felt really weird, because they'd come in, hang out and take up table space. They're writing software, or something, and they feel like they're not contributing to the shop. So we said, "Well, you know, you could get something [laser cut]." But they wouldn't know what to get. So I figured out, we charge $2 a minute for laser cutting to make the hobotoken - which is pretty cool, it's like this cool little coin thing, made of nickel. It [takes] three minutes of laser cutting, which would be $6, which is not too bad. So I charge $5 for it, and it is laser cutting for somebody who doesn't know what they want. They can buy things off of Thingiverse, or whatever, but here's a hobotoken; It's a laser cut item you don't have to think about - you could call it goodwill currency because that's the whole reason you get them. If you want to figure out some greater meaning for them, go for it. Hehe. They're worth nothing - they are cool though. I've even seen people swap them! What do you do with all the ones you get back? I just sell them again. We're always running out of them. People give them back, put them in the tip jar - and still, people ask, "Do you have any hobotokens?" How many people are usually here on a daily basis? I don't know I'm on shift a couple of days; I don't generally get any alone time so there's always someone here. A lot of people wander in, so we give the tour and I'm generally doing some production work throughout the night. There's people; there's always people. We hit over 100 [members] a little while back, and there's churn. The member number is over 100, but not all of them are active. We have some kids. I have little kids, and there are some people who have little kids so we have a kids' area. Probably the youngest person to solder here is Pierce's son - he's a member - and he's five, which is pretty awesome. But generally, the "I'm-going-to-sit-through-a-workshop" kind of kid is around 12 [years old], you know, sitting in with their parents. We've done some high-school classes with one of the local high schools, and those are 11-week courses. Some kids, we do make their parents sign a waiver, obviously. When did you start doing workshops? We started doing workshops right away. We've had an Intro to Electronics and an Arduino workshop every month since we've been open. They're almost always sold out - like, 10 people a month learning how to read data sheets, how to make schematics, how to use a simple microcontroller, how to make a circuit - we've been in this for 2.5 years, so there's a lot of people who know enough to be dangerous right now (which is really cool). We want more people to understand this, and we're always willing to host a new workshop too. So if there's something you know that you think other people should know, come talk to us. The newest workshop - we just had a Logic workshop. It's kind of funny because that is probably the oldest tech. But it's neat because all the Arduino stuff, all the microcontroller stuff is how to do stuff with code. The Logic workshops show you how to do things with just base Logic and components - which is neat because that's not buggy code at that point. It's going to do that one thing, and that's all it's going to do - but if you can get it to do it, it's not going to break and that's really important in some situations to say "This isn't the software stock." So what kinds of robots do you have here? So we have a laser cutter, we have some large-format printers for paper and things, we have 3D printers - we have a bunch of different 3D printers. We have printers that print plastic and then ones that print different kinds of plastic. Mostly we print PLA and ABS, but we have some other types of plastic that we've played with. We have a powder printer, which gives us the ability to print not only in plaster, but to do slip castings and ceramics and porcelain. We can make glass molds. Once you're printing in this plaster, you have the ability to take it to a foundry and put metal into it. But we don't have any samples of it yet. I know someone with a backyard foundry, but there's a lot of stuff we just don't get to. We have a kiln here so we can do glass, ceramics, things like that. We have a casting station to do a whole bunch of polymers. We do silicone casting, and urethane casting. We have a soldering room; we have an electronics counter - so we have a lot of different logic microcontrollers. We have a lot of different things in our vending machine, which includes Arduino shields and food. We have mate on tap and a variety of sodas. We have microscopes. We have logic analyzers. We have oscilloscopes. We have all sorts of hand tools. We don't have any big wood-working tools - we don't have any table saws. We don't have any welding capabilities - we don't do metal. We don't do big things, much more little things. Tell me about the machine behind you - is it new? Our newest tool is this Pick and Place machine. That will give us the ability to place electronic components on circuit boards. We got that one last week - it's fresh, but I wouldn't call it brand-new. It's definitely new to us! The large Pick and Place is the newest machine at Metrix. My goal is that you can walk in here at the beginning of the day with an idea or something really cool - whether it's a product or it's for your own personal gratification or a customized electronic - and make it, start to finish. You can sit here, use the Internet and figure out how to do it. Maybe take a workshop that says here's how you do certain board designs, here's how you make schematics, here's how you play with electronics - and there's generally somebody around that can help you with this sort of thing. To the point of "I want to make a prototype" for it and I want to populate it with electronics. With serviceable electronics, not stuff from 40 years ago but from 30 years ago. People are scared of electronics in the U.S. It seems like a lot of the electronics knowledge disappeared with big, easy-to-use components. So when everything got small, people were like "I don't know, it's hard" and stopped paying attention and stopped trying to understand. This voice recorder is pretty cool, you could show it to someone and take it apart and people would be like "I don't know." More than likely, it's some flash, maybe a card and some buttons on a screen. This is something you could make here - [it's] not a particularly tough device, it's not a cell phone (cell phones are really complicated!). But some other cool utility electronics would be fairly easy to make here - including, with 3D printers, all the plastic casings for it. So you could come up with the idea for some cool new thing. 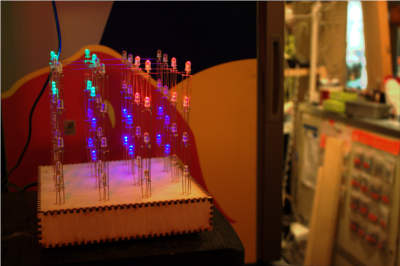 What's the most ambitious project you've seen at Metrix? There have been a lot of ambitious projects. 3D printers, I would say, are probably the most popular ambitious project. And I'm saying this because I'm looking at one and my memory is like a gnat. A 3D printer involves a lot - you have to learn about everything involved in it. There's the mechanical part, there's the electronics, there's the physical assembly as well. It's not just the mechanics of the thing; you ACTUALLY assemble it fully. There's a software component to it, and then a design component too. Once you've built this thing, there's still more to do. And none of it is particularly easy. By the time someone is done with one of these things, they're really good at it. They've soldered all the pieces, they've built all of these components, and they generally know where all the problem points are. Nearly everyone who builds one of these things, their first project after that is to build another 3D printer. Because now they know a lot about that particular thing and they want to apply it. And they know about all the problems that they just had. So they're going back into the design phase and fixing it. Do people use the 3D printers here a lot? What's the most popular tool? The funny thing is that the laser cutter is probably our most popular tool. The laser cutter is the easiest to design for. It's also one of the tools that you don't want in your house - it requires ventilation, it requires having wood lying around, bad smells: finicky robot. They are not great tools to have in the house, and around here, in your apartment. And to design for it, you can just use Illustrator, design a line drawing and then you run it through the laser and you end up with the physical object. So a lot of people will do really cool engraved stuff and other people will do 3D things. You can make a 3D printer with a laser cutter. And then you can use that 3D printer to print another 3D printer. The laser cutter, left and right images, is the most widely used machine at Metrix. It can cut things like the wooden snowflake in the middle. The 3D powder printer, on the other hand, can create things like the cube in the center. Are there currently any plans to expand Metrix? Right now, Metrix is really new and we've expanded already. When we started off, we were half the size that we are now. After one year, we knocked down one wall and took over [the other business south of here]. I like this location, and there's really no place for us to go up at this point. But up is expensive. I would say that this space is probably as big as it's going to get at this point. But the density of stuff here has grown. Every 6 months, we completely rearrange everything just because we get a new machine or we realize that it's become too dense, that we have too much stuff. So we cycle around the shop and figure out how to make it work. How do you feel about all this technological advancement? In general, people are becoming less afraid of physical things now. For a long time, the Internet was really difficult. I remember the beginning of the Internet, of the beginning of the popularization of the Internet - in the early 90s, I got into this Internet thing and I was like "Man, this is really cool." So I showed everyone I knew and I was like "Hey, you have to get in on this site, it's really cool" and they asked "Why would I want to do that?" So I would have to explain why the Internet was cool. And now, the Internet is commonplace. Everyone has the Internet on their phone, everybody uses Facebook; everybody has this common thing which is the Internet which allows us to communicate quickly, to publish things, to learn about things. And you can learn about anything on the internet. So what do you do once you have all that knowledge - what do you do when you have access to all that knowledge? You start to apply it. I didn't know anything about any of that stuff a few years ago. But because I'm pretty good at searching things on the Internet and I'm excited about these things and have the motivation to learn them because I want to do cool things - I want to make fun things. I'm like "Well, I don't understand how this works, let's tear it apart and figure it out." Get the camera, take some pictures, and we can either put it on the Internet or we can read or look at other people's pictures on the Internet and we can figure out how to build it ourselves, customize it, make it ours. And because of [the Internet], we can do it. With 3D printers, it gives you the ability to share physical designs with people. We use Thingiverse all the time here. Thingiverse is really cool because people upload a cool design, and then someone around the world can just print that thing out out or cut it out on the laser or fabricate it or be able to make a thing without having to wait around for UPS and you can customize it and it's different from the buyer-seller relationship we have right now. It puts you right in the middle of it. And that's really cool. The large 3D powder printer, left, can print not only 3D models but molds and slip casts as well. It uses regular printer ink cartridges, pictured right. Makerbot Replicators, top center, uses a plastic extrusion method to print plastic layers onto each other such as the small duck, bottom center.